Tyrion of House Lannister, mid-battle! Limited edition statue from the Game of Thrones TV series. Let the Imp of Casterly Rock defend your desk! 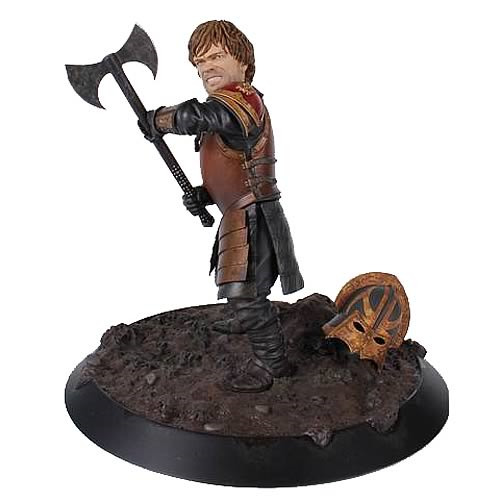 This excellent statue features Peter Dinklage's Tyrion Lannister, caught mid-battle and sporting a fierce grimace, battle armor on and flailing a two-headed axe that's almost as big as he is. A limited edition of 3,000 pieces, this is one item that fans of Game of Thrones won't want to miss out on! Measures 10-inches long x 9 1/2-inches tall. Ages 14 and up.